There’s a better potential haven than gold for investors spooked by the risk of a recession this year -- mid-sized producers who’ve outperformed both bullion and the rest of the mining industry. Companies including Canada’s Kirkland Lake Gold Ltd. (KL.TO) and Australia’s Northern Star Resources Ltd. have scope to extend gains and should be in focus for investors looking for a safe harbor, according to Joe Foster, New York-based portfolio manager for the US$600 million Van Eck International Investors Gold Fund. Kirkland Lake, Northern Star and two rivals have the best returns in the Bloomberg World Mining Index over the past 12 months -- a period during which both the gold price and the equity benchmark have declined. Spot bullion began rallying in the last quarter and is forecast to end this year higher, according to analysts’ estimates compiled by Bloomberg. 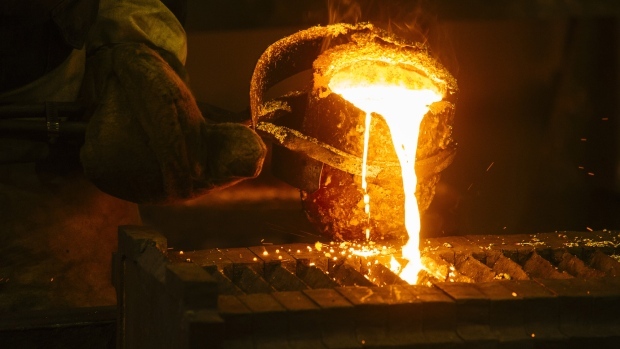 The metal will climb to US$1,425 an ounce, a price level not seen in more than five years, as geopolitical tensions fuel central bank purchases and recession fears boost demand for defensive assets, Goldman Sachs Group Inc. said this month. Gold’s traditional status as a haven asset has been called into question in some recent periods of volatility. Bullion remained largely unmoved for much of 2018 as U.S.-China trade tensions unfolded, with investors fleeing instead to the dollar. Producers too have also disappointed in the past. A Bloomberg Intelligence index of senior gold equities lost more than three-quarters of its value from late 2011 through the end of 2015 as companies reeled from failed deal-making and a tumbling price of the metal. Still, gold equities are “an attractive option for a diversified portfolio, especially if we are moving into a period of higher market volatility,” said Stephen Land, portfolio manager for the Franklin Gold & Precious Metals Fund, which manages about US$1 billion and holds producers including B2Gold Corp., Newcrest Mining Ltd. and OceanaGold Corp.
“The market has ascribed much higher multiples to those companies which have been able to pay off debt and show growing cash balances,” Land said. Current strong performers will need to continue to innovate to retain a premium, with most competitors now embracing a similar playbook, he said. Investors are seeking out strong management, or operational teams, regardless of the industry, and should be drawn to the gold sector in any search for a haven, Northern Star’s Executive Chairman Bill Beament said in an interview. Mid-sized producers have improved their record in boosting efficiency in recent years and some are poised to reap more benefit than larger rivals from a rising gold price because they have more ability to grow production, according to Rick Rule, President & CEO of Sprott U.S. Holdings Inc., a subsidiary of Toronto-based Sprott Inc. (SII.TO), which had $10.1 billion under management as of Sept. 30. A coalition of investors, including firms backed by billionaires John Paulson and Naguib Sawiris, have also praised companies including Kirkland, Northern Star and Evolution Mining Ltd. because top managers have a high ownership-to-pay ratio, a metric the group sees as an indicator of superior performance. Gold producers are also in line for a potential further boost from the sector’s wave of deal-making that’s seen the largest companies, Barrick Gold Corp. and Newmont Mining Corp., strike separate deals to acquire rivals in recent months. “We continue to see consolidation as a major theme in the industry and expect 2019 to be an active year for M&A as companies look to improve their asset bases and regain scale to remain relevant to generalist investors,” Franklin’s Land said.